The first time the Runner installs a card each turn, he or she must trash 1 card from his or her grip. All of the click compressing resources (Professional Contacts) in the world won't relieve the pressure this card can put on the runner - how much worse are the cheap constructive pieces of hardware and software that runners install without even thinking about if they each cost an extra click? You can ignore the pseudo 'net damage' this card deals... but at a certain point you run out of cards, and that's when the corp will find you and burn your house down. Let me say that as a shaper player, I hate to see this card. It's not just the click losses. It's having to drop cards you want in order to play the cards you need. 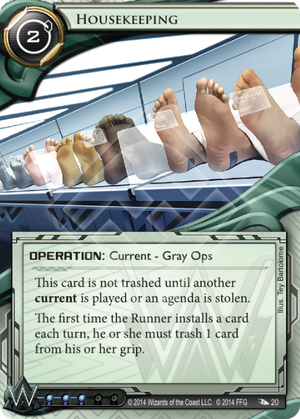 This card is very good against anyone playing a lot of installed cards, and is always useful, because every runner has more installed cards than even just their breakers. This card is great in a Government Takeover Weyland deck. Extremely low agenda density means this card stays around for a long time. If found in your start hand it tax the runner significantly, giving you plenty of time to grow your pool and glacier up. Great both as Butcher-shop and Vegan as it will stress out the runner. Possibly not as OP as it seems at first sight, but I really hope it has some nice art ... since I suspect I'll have to be looking at it from across the table more times than I'd like to.